In fact, when Jen of La Senorita Jolie reached out to me to see if I might be interested in styling a piece from her Fall line, I replied with, "thanks so much for thinking of me, but you know I'm not a fashion blogger, right?" And then my sister in law shot me a text that said, "are you doing a fall Mom style shopping guide? If so, I'll hold off on some purchases until you point me in the right direction." So, here's the deal, it's important to me that as more opportunities pop up, I continue to only work with brands that truly fit into my life. It also happens to be crazy important to me that I maintain my (way too high) level of transparency. And speaking of way too much transparency, I've decided to share what size I'm wearing in any piece that I talk about so that it's clear that 1. I have a real body and 2. dressing my post baby body (and yours, if you have one) in a flattering way is possible without too much effort. With that said, I took a peek at La Senorita Jolie's line and thought that I could, without a doubt, style the Izabelle top in my every day normal life. In fact, when it arrived, I loved the insanely soft material and raw neckline so much that I actually styled it three ways: MDO Drop Off, Weekend and Date Night. In all honesty, I am always suuuuper proud of myself when I get my kid dressed, lunchbox packed, breakfast ready and out the door on time for "school". If I manage to change out of my pajamas then I high five myself. When I don't manage to change out of my pajamas, I slink in and try to avoid eye contact with the other moms (especially that one gorgeous mom who has a toddler and a newborn and is.always.dressed. how does she do it?!). Anyway, this is my new go to drop off outfit. I am, in fact, wearing my favorite layering tank underneath the Izabelle top - both of which feel like pj's so I'm not really reaching too far out of my comfort zone. My denim is comfy and less than $30 and the cross body on my diaper bag makes wrangling the baby, his gear and my sanity possible. Throw my hair in a messy bun top knot, my go to casual necklace and sunnies on to hide my no make up face and I'm out the door. I ordered the Izabelle in Large (color: wheat) and I think it runs true to size. 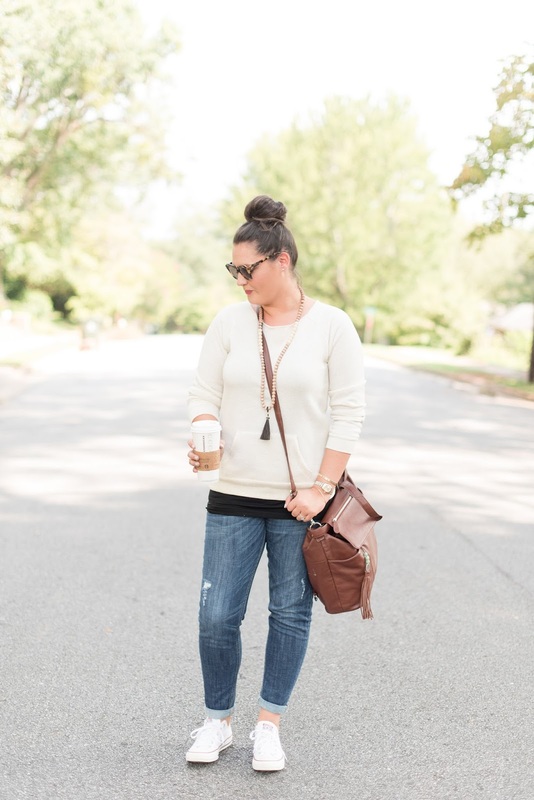 If you are bigger busted (like me), have a long torso or want a slouchy look, definitely size up. All pieces in the La Senorita Jolie line are machine washable (yes!) and come in sizes up to 4XL. I'm obsessed with a weekend with no plans. We are the kind of people who start out with a loose idea like "um, let's head to the Farmer's Market" and then just see where the day takes us. I tend to make sure that I'm very comfortable but able to go pretty much anywhere - and honestly, the Izabelle top can go anywhere. 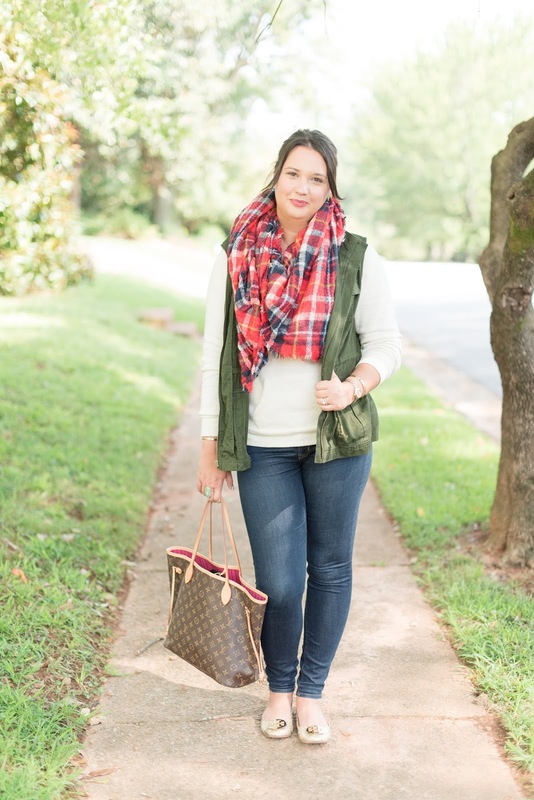 Paired with my favorite flats and a few layers that I can ditch as the day warms up (this vest is my current fave, less than $30 and super on trend for Fall), dark denim and my big tote, I can go from the Farmer's Market to lunch downtown to manicures with girlfriends to dinner. This is a total tangent but I am the only one who is loving the jewelry section at Old Navy? 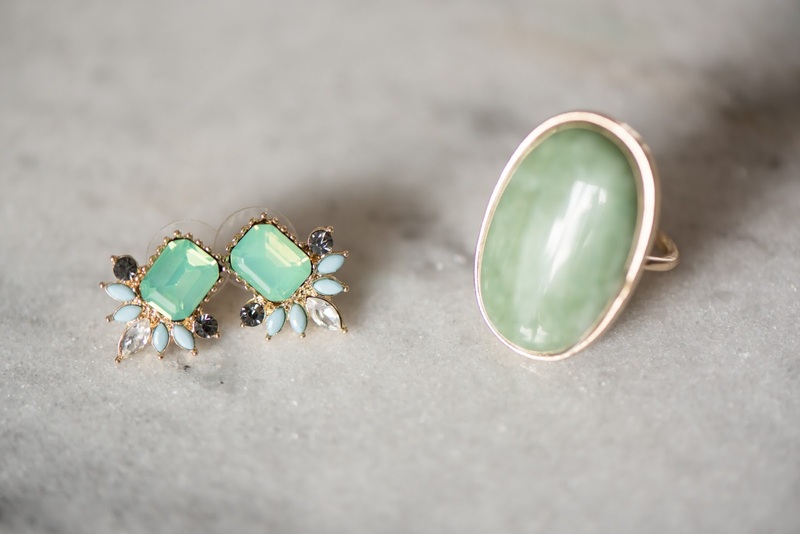 I love statement rings and had to grab the faux jade ring below. I paired it with a set of what my best friend Megan calls "fancy studs" - fancy because they're pretty and studs because my baby can't rip them from my ears. Dinner and movie without a baby in tow? Ah, living the dream. 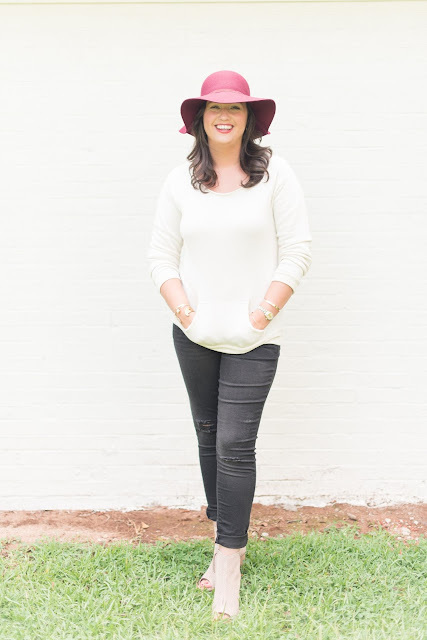 The Izabelle top paired with (super cheap) distressed black denim, suede peep toe booties, statement earrings and an eggplant floppy hat makes me feel put together and trendy. I don't think I've really explained how soft and comfy the top is but let me just say that I could eat a huge dinner and then manage to not freeze my nips off in the theater all in one piece. Yep. Date night goals. 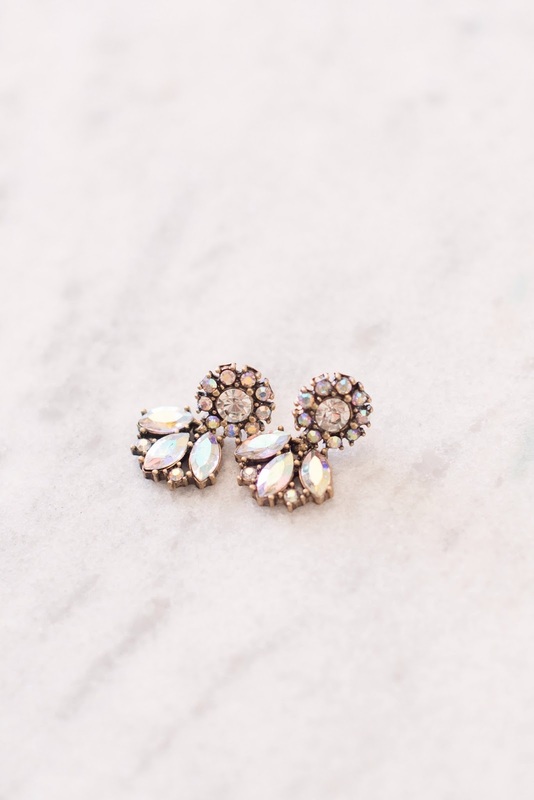 Since a date night means no grabby baby fingers, I jump at the chance to wear statement earrings - these dainty flower earrings are just the right amount of sparkle, especially when paired with the rich eggplant of my hat. So, there it is, my attempt at being a fashion blogger. I hope so because La Senorita Jolie is offering everyone free shipping with the code KMJBHC at checkout. If you're interested in becoming a stylist with La Senorita Jolie check this out for all kinds of swag (signing bonus for the win) and info. Follow on Facebook, Instagram and Twitter for the latest. P.S. Thanks for the pretty pics Christa! Boring Disclosure: I was obviously provided an item of my choice to review. All opinions, fat rolls and commentary are my own. Duh. Love the three looks! And I love to see someone "modeling" clothes that's actually my size! I too like to be comfortable and stylish! And now I want to check out the old navy jewelry section... I'm loving this "fancy studs"! Too cute! I would wear all those outfits- it's a nice transition into 'fall'! 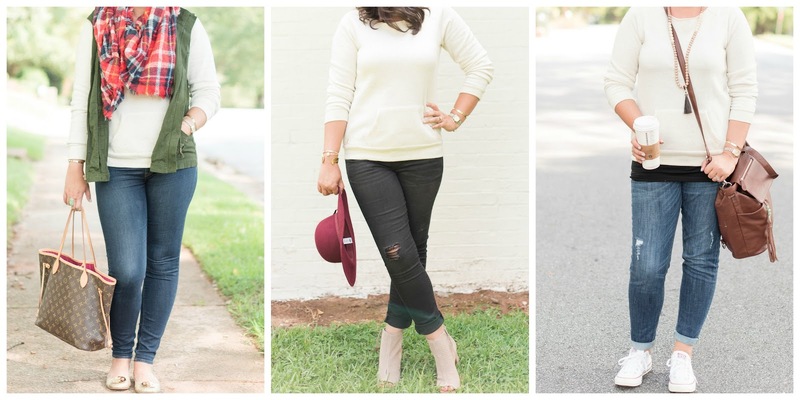 LOVE this post and all three looks!!! I'm definitely going to have to check out that sweater (and the jeans you linked to!) because these outfits are all very me too! What you call your mom uniform is also my uniform and I'm not a mom....I will probably go out in sweat pants when I'm a mom then! You are a beauty!!! Love it mama!